TFD - I'm a bit worried. You're a clever man...academically clearly more developed than me. Maybe it's a prank and I have missed the joke, but, with a claim that the photo in question is not photoshopped, you have posted an image of a single spiral made from a double line, and then linked to an image of a double-spiral made from two single lines, with a clear suggestion that they are the same phenomenon! If it helps...nothing reported in The Daily Mail is ever true. Ever. ____ TFD, how many degrees S are you and druidlings? It's suspected to be a a malfunctioning rocket. Still cool, though. 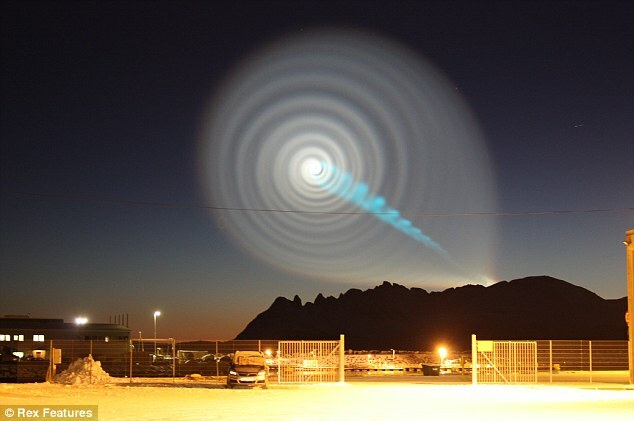 with a claim that the photo in question is not photoshopped, you have posted an image of a single spiral made from a double line, and then linked to an image of a double-spiral made from two single lines, with a clear suggestion that they are the same phenomenon! ____ TFD, Then your Summer/Winter seasons are not quite as different as here as 44N. From your vantage do you experience The Antartic Borelis. ____ Also how did you type the degree? The Aurora Australis is only visible here during the mother of all solar storms (i.e. it's happened once to my memory) and you needed to be far from city lights to see it. Casa del Druid is about 1km from the city centre. Also how did you type the degree? ____ Thanks, and too bad on seeing the stars, and other night time events, we are about twenty miles out but the lights from a casino fifteen mile away to the South do become distracting. ____ Could this be the source of the picture?? ____ Grummash, have seen old news reels of the Air Battle over Britten I was wondering if the event happened so fast that on a normal camera it would appear as a stopped motion. ____ Near here the Indian Casino has four of those huge Search Lights that they turn on at Night. When the clouds are right the show is fairly interesting. A time lapse photo (box camera) would show much the same thing. You, me, and 99.99% of those who saw the picture, thought it looks like a photoshop job, that's why it's so amazing that it's real. No offence to you. But I would say that story is a heckuva lot of bullava! If my eyes are right on this one, that is certainly a death ray! ____ Now, I was not even thinking that way. However it does look like an antenna used for satellite communication. The reflector element is the part that looks like an electric stove (burner) the radiator looks like the DNA spiral Helix. For each satellite both elements must match the inverse of the satellite, clockwise helix or ccw at both ends, however they can mix and match spirals and helix. So for amateurs to read the sats. we build a four element antenna, we look up the sat we are listening for, and make the connections to the antenna for that satellite. Hmmm... looks like a rather rough landing in the Tardis to me. Must be the Daleks again.